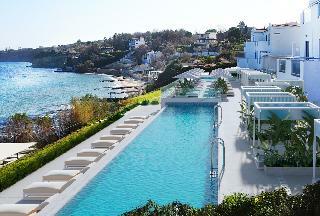 This magnificent resort is nestled in Zante on the picturesque Greek island of Zakynthos. Set right in front of a beautiful sandy beach and surrounded by verdant hills, this property enjoys a peaceful and quiet situation within ease of access to numerous quaint places of interest, including tiny markets with fresh local products, romantic restaurants and many nearby historical attractions such as the Anafonitria Monastery and the Dionysios Solomos Square. The hotel is sure to delight visitors with its charming design and welcoming atmosphere. 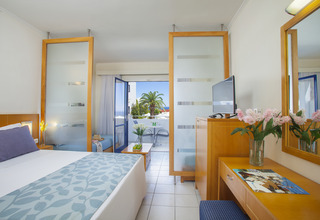 The spacious superbly decorated guestrooms feature views over the sea or the marvellous landscape. 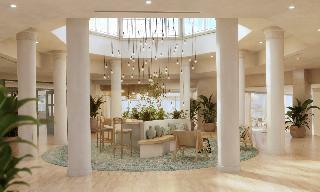 Patrons will have the opportunity to savour flavourful regional specialities, which may be followed by a refreshing drink from one of the on-site bars. The establishment boasts a sparkling swimming pool, a paddling pool, children's playground, sports facilities such as tennis court.